This article from the Associated Press via Asia Correspondent brought out the armchair historian/Indiana Jones style of archaeology in me. “China and Kenya plan to search for ancient Chinese ships wrecked almost 600 years ago off Africa’s east coast. An agreement was signed for a three-year project funded by China’s Commerce Ministry to explore waters near the popular tourist towns of Malindi and Lamu. Exploration work will be conducted for up to three months each year, with the first group of Chinese archaeologists due to arrive as early as July, Xinhua said. The sunken ships are believed to have been part of a massive fleet led by Ming dynasty admiral Zheng He that reached Malindi in 1418. Kenyan lore has long told of shipwrecked Chinese sailors settling in the region and marrying local women. Zheng’s seven voyages marked a high point in Chinese power. But imperial rulers soon lost interest in the outside world and canceled further exploration more than a half century before Columbus reached the New World. For those unfamiliar with this stage of Chinese history, Zheng He’s journeys mark the apex of Chinese exploration and participation in the global community (that is until now). Zheng He (郑和) was an admiral sent by Emperor Yongle, who wanted to establish a Chinese presence, impose imperial control over trade, and impress foreign peoples in the Indian Ocean. There was also some notion of extending the incredibly complex Chinese tributary system (where other sovereigns paid tribute to China’s emperor: Korea, Japan, and other smaller nation-states included). So, Zheng He makes these journeys with an armada of 300+ ships and 20,000 crew (now that is an armada!) in the early 1400s. He explores modern Indonesia, Malaysia, India, and then on to East Africa. He establishes a presence in each of these places (mostly diplomatic) and taps into the existing trade conditions of the Swahili Coast (Kenya, Tanzania, etc. ; Zheng He seemed to have made it through to Somalia as well). This was all 80+ years before Columbus left in his tiny (by comparison) ships for a route to the same islands that Zheng He had just been charting. However, in one of those decisive moments in history when one person’s decision literally affects the future of everything that comes afterwards, the Chinese Emperor died. His successor, the Emperor Hongxi decided to bring everything to a halt. Although this wasn’t as immediate a process as is often depicted, China began its slow transition to an inward facing nation (at least shunning those outside its immediate tributary system). Zheng He made one more voyage, but that was it. Zheng He died during the last voyage and was buried at sea. The Fra Mauro World Map of 1420. 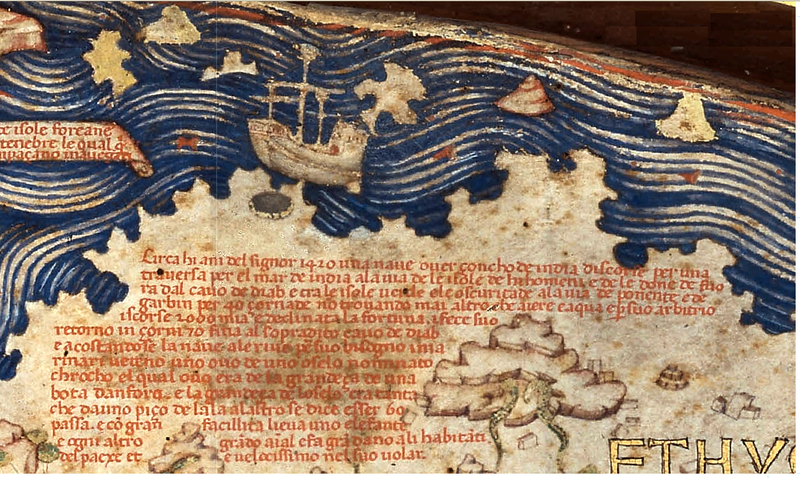 This Italian map outlines the journey of what is believed to be an Indian ship heading out into the Atlantic in 1420, 72 years ahead of Columbus. Many believe this ship not to be Indian, but rather a ship from Zheng He's armada. It really is a fascinating story and at least one author has made the claim that Zheng He discovered America on one of the last of these journeys. Gavin Menzie’s 1421 is a great read, certainly, but I suppose the jury will always be out on these sort of claims. What can’t be disputed is the size of these ships, which were juggernauts compared to Columbus’s vessels. Zheng He's ships compared to those of Columbus. Many thanks to the Vancouver Maritime Museum. What is also fascinating is that Zhang He basically helped spread Islam throughout the routes that he navigates. Zhang He was Muslim (as are many Chinese in the far western provinces). Both his grandfather and great-grandfather made the pilgrimage to Mecca. I suspect that in certain areas of the routes that he navigated (mainly parts of the Swahili Coast and perhaps India? ), his religion actually assisted his diplomacy. It represented common ground that would have been difficult to establish without it.